Was this the desired impression? Was this the impression you wanted? A few weeks back I responded to some survey from Google and they sent me a $15.00 gift certificate as a "Thank You". I thought that was pretty generous as the survey probably took less than 20 minutes. Turns out I was wrong. It wasn't generous at all. Worse, it actually ended up ticking me off. The gift certificate could only be used at a specific Google Merchandise store. Well, that's not so awful, right? It's still free stuff, right? Not quite. The store has a very limited selection and most of it is high priced. So high priced that even with a $15.00 discount, I saw nothing worth buying. Not only was it high priced, but the shipping charges were outrageous. I found a few things under $15.00, but the shipping was another $8.00 - this for items that obviously weigh just a few ounces. 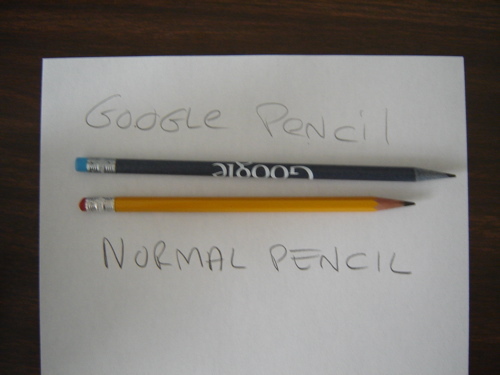 I finally found a set of "Google Pencils" that came to twelve something with shipping. Yeah, $12 plus for eight pencils. But what the heck, still free, although now I had spent another ten minutes just trying to find something I could actually buy with this lame "gift". At this point I was mildly annoyed. Does Google really need to make obscene profits from selling its own branded merchandise? Somehow I suspect that they do not. If Google can do all the other subsidized stuff they do for free, I bet they could afford to sell branded stuff for reasonable prices - and remember, it is all free advertising for them. At any trade show, I bet they hand out mountains of this stuff. They could price it reasonably. I had pretty much forgotten all about this when the pencils arrived. Pretty things, of course sporting a prominent Google logo. I put one into our electric sharpener and had difficulty because these things are just a little thicker than a standard pencil. Still, I did manage to sharpen it. It was then that I got really ticked off because the stupid things are almost useless. A #2 pencil is a nice thing to write with, these are harder and write far too lightly. We aren't going to use them. So now I'm out the time I spent on the survey, the time I spent at that over-priced store and the time I spent sharpening one of these things and I have nothing of even minimal value to show for it. Thanks, Google. That was a wonderful overall experience. Have you seen those TV ads where the kid is given a bike but then told he can't ride it outside of a tiny box? Yeah, it's a little like that. When you give a customer a gift, you really don't want to make them feel vaguely cheated. Google isn't going to lose my or anyone else's business because of this, but other businesses with less market penetration do similarly stupid things. It is especially prevalent on the web, but you do see it everywhere, and some of it is much worse than this. Still, if I had the ear of Google CEO Eric Schmidt, I'd advise him that gifts should be real. As I said, Google certainly won't lose my business. But I sure won't fill out another survey, will I? -> Was this the desired impression? A little while back, MacTech magazine had a promotion to get a Gelaskins gift certificate with a subscription, but most of their items were over the amount given (I forget the amt). I ended up just giving it to my boss (who actually paid for the subscription). Your experience caught my attention and I was totally unaware that Google had a merchandise store, I think I will check it out. From what you mentioned about the prices I am not sure I can afford to buy anything. Thanks for the tip on the surveys too!